Acknowledgement and Dedication of this content is made to the late Colonel Doctor Roger Freeman, OAM, RFD, author of "Second to None". Roger Freeman passed away on the 10th November 2013. He gave the people of South Australia a wonderful legacy in two works that are unequalled. The 50th Battalion in "Hurcombe's Hungry Half Hundred", Peacock Publications 1990, and the 32nd Battalion in "Second to None" Peacock Publications 2006 are anthologies of letters home, written by the soldiers of the two Battalions. Together with photographs of what seems to be just about every soldier in each of the two Battalions, Roger connected their identities, experiences, aspirations, fears and in many cases the ultimate fate of these men, in a unique and compelling way. Their stories provide a unique and priceless insight into the lives of men who are otherwise just names on a memorial or on a nominal roll somewhere, or in the words of songwriter Eric Bogle "fading to yellow in an old leather frame". Image AWM Negative E02832 showing officers and NCO of the 8th Brigade engaged in Map reading training 20 July 1918. The 32nd Battalion was raised at Mitcham, on the outskirts of Adelaide, on 9 August 1915. A and B companies were raised from South Australian enlistees - another two, C and D companies, were formed in Western Australia and joined the battalion at the end of September at Cheltenahm Camp (another metropolitan racecourse) having transited from Perth on the HMS Indarra on the 25th September. Numbers of men were subsequently transferred to the 14th Field Artillery Brigade in Egypt. The inaugural Commanding Officer (CO) was Lieutenant Colonel D.M.R. Coghill, a citizen soldier without any combat experience who was formerly the Headmaster of Woodville High School. His Second in Command (2IC) was Major J.J. Hughes. The battalion underwent further training and received another draft of Western Australian reinforcements. The 2nd through 12th reinforcements were all from South Australia and they all embarked from Outer Harbour on 18 November 1915 aboard the HMS Indarra, bound for Egypt. The men of the battalion came from all different walks of life. Most came from urban areas but there were many 'from the bush' and in the case of the Western Australians from the mining and forestry areas of that State. There were men of British origin, Nordics, Russians and two aboriginal men, Willy Karpany and Everett Sumner. There were some with prior military experience. Walter Banning began his service in India and served in the relief force that raised the siege of Chitral in 1895 and then in the Boer War. Many others had Boer War service. There was even a Rhodes Scholar, in Frank Williams. The 8th Brigade was raised in Egypt under the command of Brigadier Edwin Tivey. 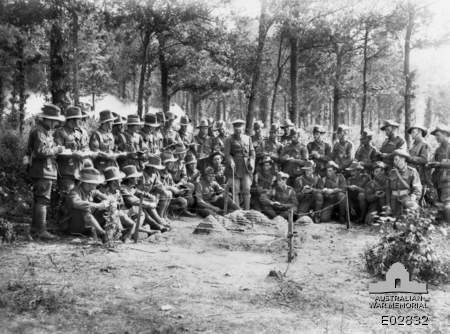 The 32nd Battalion was assigned to it, as part of the newly raised 5th Australian Division in Egypt. It then proceeded to France, destined for the Western Front, in June 1916. The 32nd Battalion fought its first major battle at Fromelles (warmemorial.erato.vm.e2.com.au)on 19 July 1916, having only entered the front-line trenches 3 days previously in what was known as 'The Nursery' because it was a quiet sector. Notwithstanding that, the Battalion sustained its first fatal casualties from enemy action through shelling and trench raids in the days prior to the 19/20th July. The 32nd Battalion was to make history for all of the wrong reasons, when a major attack was planned to fix the German defenders in position and prevent their being used to reinforce the Somme front further south. The attack was a disastrous introduction to battle for the 32nd - it suffered 718 casualties, almost 75 per cent of the battalion’s total strength, but closer to 90 per cent of its actual fighting strength. The Battalion was part of the 8th Brigade on the left of the Australian line and managed to penetrate the German position to a greater extent than their comrades in the 14th and 15th Brigades. Unfortunately this meant that they became 'enfiladed' by German machine guns making their position untenable. They were cut off and a great many were killed behind enemy lines, or taken prisoner. Many of those who died behind enemy lines were among those soldiers whose remains were discovered in a mass grave near Pheasant Wood in 2008, and who are now interred in the new Commonwealth cemetery on the outskirts of Fromelles. The 5th Division was rendered non-effective by their losses at Fromelles and underwent a period of reinforcement, re-consolidation and retraining afterwards. Although it still spent periods in the front line, the 32nd played no major offensive role for the rest of the year. LtCol Coghill was succeeded after Fromelles by LtCols Purser and Beardsmore in quick succession and then LtCol Charles Davies, a New Zealander who was to command the battalion for most of the rest of the war. In early 1917, the German Army withdrew to the Hindenburg Line allowing the British front to be advanced and the 32nd Battalion participated in the follow-up operations. The battalion subsequently missed the heavy fighting to breach the Hindenburg Line during the second battle of Bullecourt as the 8th Brigade was deployed to protect the division’s flank. The major battle in 1917 in which the 32nd Battalion played a major role was Polygon Wood, fought as part of the Third Ypres (warmemorial.erato.vm.e2.com.au) campaign, near the city of the same name in Belgium on 26 September. Unlike some AIF battalions, the 32nd had a relatively quiet time during the German Spring Offensive of 1918 as the 5th Division was largely kept in reserve. The Allies launched their own offensive with the battle of Amiens on 8 August, in which the 32nd Battalion participated. It was subsequently involved in the operations that continued to press the retreating Germans through August and into September. The 32nd fought its last major action of the war between 29 September and 1 October when the 5th and 3rd Australian Divisions and two American divisions attacked the Hindenburg Line across the top of the 6-kilometre-long St Quentin Canal tunnel; the canal was a major obstacle in the German defensive scheme. In late 1918, the charismatic Major Blair Wark was acting commander for the final stages of the war, for which he was awarded a Victoria Cross. The battalion orders detailed in the War Diary provide a very good insight to the nature (see link) of combined arms tactics that the Australians had developed under Monash and mastered by this stage of the war. The 32nd was resting and retraining out of the line when the war ended on 11 November 1918. On 8 March 1919, after the gradual repatriation of men to Australia, the remnants of the 32nd Battalion were merged with the 30th Battalion. In a subsequent post-war re-orhganisation of the militia, the 32nd was moved under Victorian jurisdiction. Adapted from the introduction by Roger Freeman in "Second to None". To the memory of Doctor Roger Freeman, who passed away on Sunday 10th November 2013 at home, and his superlative work "Second to None" an anthology of the letters of the men of the 32nd Battalion.